Since leaving his native Rhode Island, Brian Drye become a scene-maker in Brooklyn, as a frequent sideman and bandleader for Bizingas and co-leader of The Four Bags. 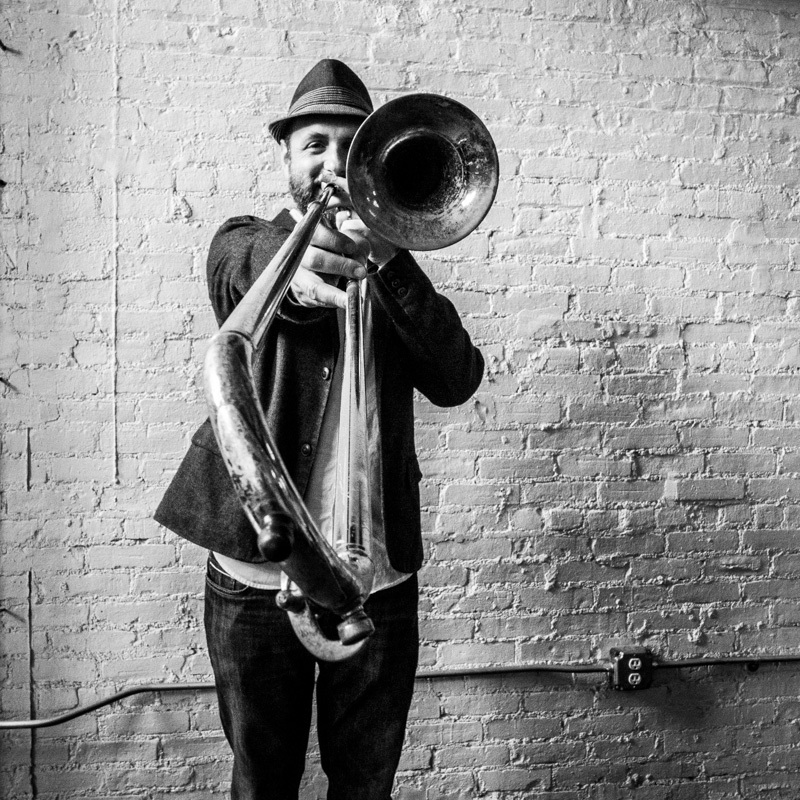 In 2008, Brian created Ibeam Brooklyn, as a teaching, performance and rehearsal space for professional musicians and students located in the Gowanus area of Brooklyn. The place has been the germination spot for many projects, large and small, from ECM to Clean Feed and Sunnyside that you’ve seen cross your desk in the past 5 years. Starting a musical venue takes perseverance and guts. Tell us what led to you launching the Ibeam Brooklyn. Originally I opened it as a teaching space but due to a lack of spaces to play in the city, we started having some informal concerts at the space. Once we graduated to a concert grand piano, the whole game changed and suddenly we could be taken seriously as a potential venue. The Ibeam is at the center of the New York creative music ecosystem, both geographically and musically. What is it like to be a keystone of such a scene? Do you feel like you are taking part in something special? The musicians make Ibeam what it is and the location is convenient to where so many jazz musicians live. The size of Ibeam makes it an ideal performance space for a music which doesn’t always have a large audience. Ibeam supports the musicians playing there because there is no pressure to bring a certain # of guests or sell a certain # of tickets. There is great comraderie among the musicians who are members at Ibeam and perform there regularly. The musicians who perform and rehearse there make it special and I feel lucky to be a part of it. How is the overall health of the venue? What kind of general turnout do you get? It really depends on the artist, how much it’s promoted and who else is playing. It could be as many as 50 or as few as 5. Even a concert with 5 guests is something special and intimate. I think that my favorite audience is about 20-25. The place is quite full but it’s not so much pressure as large audiences. Is running the venue the complete focus of your life, or do you get a chance to take a breath from time to time? Aside from running Ibeam, I teach privately, work as a Teaching Artist for Carnegie Hall and perform as a professional Trombonist and Pianist. I spend most of my time composing and performing with my original groups such as Bizingas and The Four Bags. Aside from live shows, what other functions is the Ibeam used for? Ibeam has a membership which gives people access to the space for rehearsals. Occasionally I rent it to non-members and it’s sometimes used for live recordings. The Ibeam hosts quite a number of shows that are jazz centered and leaning toward the avant side. Are your own efforts with Bizingas also in that same camp? Bizingas is definitely similar to most of the groups that perform at Ibeam. It’s sometimes difficult to say exactly what type of music beyond Jazz and Avant that Ibeam hosts, since everything is so varied. In addition to upcoming shows, what events are coming to the Ibeam that we should know about? Any big plans for the future? The show is previewed by the Baltimore City Paper. When Charles Amirkhanian was 5 years old, he received a John Cage record as a gift from his father. It was a mistake — the elder Amirkhanian had taken it to be an album of traditional Armenian music, their cultural heritage. Instead, young Charles was introduced to a sound that was anything but traditional, and in that music for prepared piano, he found a life’s calling. Some 60-odd years later, the director of the Other Minds festival — the West Coast’s premiere experimental music event, now in its 19th incarnation — points to that accident as a fairly fortuitous one. Leslie Ross and Katherine Liberovskaya Leslie Ross and Katherine Liberovskaya have again teamed up for a program of collaborative pieces for bassoon and electronics. [INTERPRETATIONS] Thomas Buckner with Bradyworks Performing works by Australian composers Eric Griswold, John Encarnacao, Tim Brady & Annea Lockwood. Skeletons // Greg Fox // American Academy of Achievement Skeletons perform material from their newly-recorded album as part of their Jerome Foundation residency. Intersections: An Evening with Build, itsnotyouitsme, Emyprean Atlas, and Special Guests Four ensembles come together for a mini-fest of music at the intersection of composition and a band aesthetic. Record release for Skirl 025!